Incident Details: The Team was requested to attend to a fallen walker with a dislocated shoulder. This turned out to be a fallen climber with a dislocated shoulder, above the second pitch on Troutdale Pinnacle, at the start of the traverse – who had four others with him, who were cragfast! In addition, a sixth climber was stuck at the other end of the traverse below the Pinnacle itself. The Team immediately despatched a Landrover with 5 members and the necessary kit to start the rescue, a further 8 went in one of the Sprinters and others attended direct to the scene. In the meantime, the Team received an offer of assistance from the Coastguard helicopter to try and winch the group off the crag. 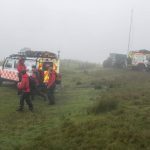 Given that this would have needed a winching distance of over 60 metres, and as the Team were already on the crag, they were persuaded to come and stand by to assist with the solo cragfast climber, once the Team had evacuated the others. In what turned out to be a reasonably slick rigging operation, the casualty was recovered by a Team member down to the foot of the crag in about 90 minutes, , and then taken down to an ambulance. The other cragfast climbers at his location were lowered to the ground, and then Rescue 936 swooped in to skilfully lift off the last one off – a manoeuvre that was not without a fair degree of risk, given the proximity of the rockface. He was flown to Crow Park, Keswick and dropped off at Keswick’s base to await the arrival of his mates. This action saved the Team a considerable amount of time, for which we were very grateful.